Presented here, and exceptionally well done and charming needlework "Theorem". This, a very naturalistic representation of fruit . . . so realistic in its presentation. Cherries, Strawberries, a Lemon, and a Melon all are stitched to the last detail. Notice how the lemon peel is depicted. Wonderful! This is an uncommon presentation of a Theorem dating c. 1840-60. 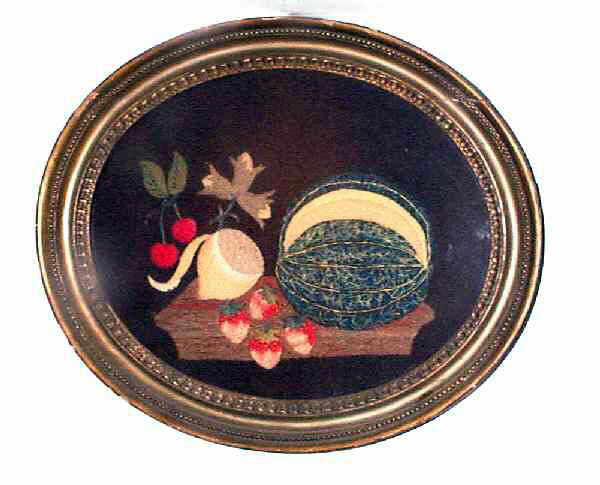 The condition is excellent and it is beautifully presented in an oval lemon gold frame. The size, including the frame is 16" x 13".